Integrate Zoho SalesIQ with Google Analytics and track almost all the prime Zoho SalesIQ related actions and events right away from your Google Analytics dashboard. Integrate Zoho SalesIQ with Google analytics and track how your live chat operations contribute to your goals. See all interactions of your live chat operations with your visitors and track its effectiveness. SalesIQ gives you fresh insights into how visitors use your live chat platform. Once you have pasted the Zoho SalesIQ script into your web pages, the script will automatically detect the Google analytics code available in your website. If everything is in place, Zoho SalesIQ will start reporting events to your GA automatically. All you have do is enable Google analytics in the embed settings. First off, make sure that you have pasted the tracking code (Admin > Property > Tracking Info > Tracking Code) of Google Analytics in all the pages on which you have embedded Zoho SalesIQ's widget code. 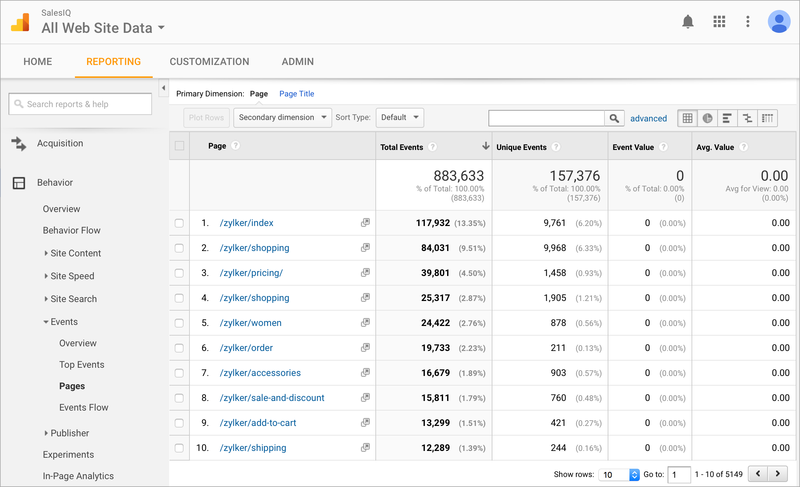 Navigate to Settings > Integrations > Google Analytics. All the websites that you have configured till date will be listed down and you can choose to either enable or disable tracking of Zoho SalesIQ related events on them by clicking on the toggle bar right beside. Chat button click Number of times the chat button was clicked. Chats closed Number of times the close icon on the chat window was clicked. Chats minimized Number of times the minimize icon on the chat window was clicked. Chats connected Number of chat requests picked and assisted. Chats ended Number of chat sessions ended by visitors. Files transferred Number of files transferred by visitors to your operators. Chats printed Number of chat transcripts printed by visitors. Chats emailed Number of chat transcripts emailed by visitors. Ratings submitted Number of submitted visitor ratings. Feedbacks submitted Number of submitted visitor feedbacks. Chats triggered Number of proactive chats initiated. Chats initiated Number of chats initiated by the visitors. Offline messages submitted Number of messages submitted by visitors when the widget is offline. Chats missed Number of chat requests missed by the operators. Accessing your Zoho SalesIQ live chat events on Google Analytics. Log in to your GA account. Click on “Reporting” on the top then choose “Behaviour” from the left sidebar. 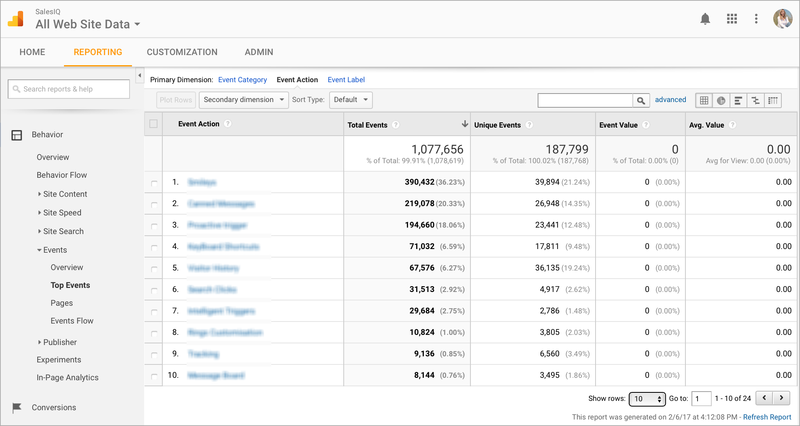 Select the “Top Events” and select “Sales IQ” from the top events. The graphs here indicates the amount of SalesIQ Live Chat events activity on your website. Scroll down further to see the list of events. How to see the pages which gets the most chats events. Click “Pages” then select the page of which you like to see the report. Now select SalesIQ from the list to see all the Live Chat events from the page. How to see the live chat events in real time? Click on “Reporting” the top then choose “Real- Time” from the left sidebar. Now select the events from the list under the real-time. Click on the SalesIQ to see the Live Chats events in real time.